TEMPE – Arizona State coach Todd Graham said he and his team aren’t taking UCLA lightly, especially since the Sun Devils have Mike Bercovici filling in for injured starting quarterback Taylor Kelly. But after a practice in Sun Devil Stadium on Tuesday, Graham said the change at quarterback isn’t going to be an issue in Thursday’s home game. “I’m not worried about how Mike is going to respond. He’s a veteran,” he said. Graham said he and Bercovici have talked over the last few practices about how his strengths can translate into success for the team. With weapons like receiver Jaelen Strong and running back D.J. Foster, Bercovici has an experienced offense to work with, Graham said. Graham’s focus for taking down the Bruins: mental focus. After three years as a backup quarterback, Bercovici will put his experience to the test as the Bruins’ first Pac-12 opponent. Prepping for UCLA, the redshirt junior said his communication with the offensive line and the receiving corps has been constant. “I text Jaelen (Strong) just about every night and I talk to D.J. about our expectations going into the week, but we feel confident,” Bercovici said. “We expect nothing but perfection when we step out there Thursday night,” he added. When ASU beat UCLA last season to clinch the Pac-12 South, Bercovici didn’t play, but he said his goal is to recreate the feeling they had that night in Pasadena. There’s a chance Bercovici won’t be the only backup quarterback on the field Thursday. UCLA coach Jim Mora has yet to comment on starting quarterback and Heisman hopeful Brett Hundley’s status after his injury in last Saturday’s game against Texas. Junior cornerback Kweishi Brown said the team doesn’t care who leads UCLA this week, but he said it would be interesting if the Sun Devils have to face backup Jerry Neuheisel, who stepped in for Hundley last week. “(Neuheisel) is going to be nervous, more nervous than we’re going to be,” Brown said. The Sun Devils’ defensive line is young. With last season’s departure of Will Sutton and Carl Bradford, Brown is part of a struggling defense that allowed 545 yards to Colorado (1-2, 0-1 Pac-12). Brown said despite working through the difficulties of a young line, he feels good about their preparation for UCLA, especially in the secondary. “UCLA has big receivers like Jaelen Strong. I did my research on those receivers,” he said. “That’s a great opportunity to start this game because I like going against big receivers. “They don’t know what’s coming,” he added. 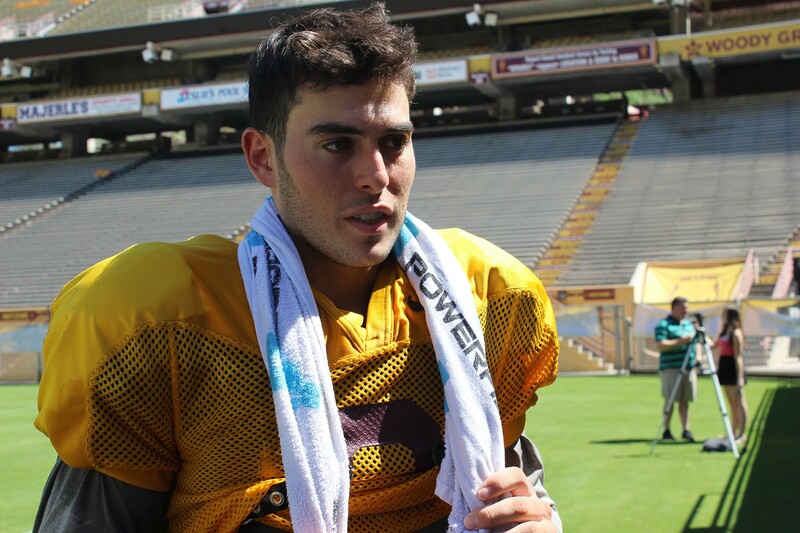 Backup quarterback Mike Bercovici said he's ready to lead Arizona State in Thursday's home game against UCLA.